Aiming to live off your investment income is a noble goal, but it may cause people to save more than they really need to for retirement. 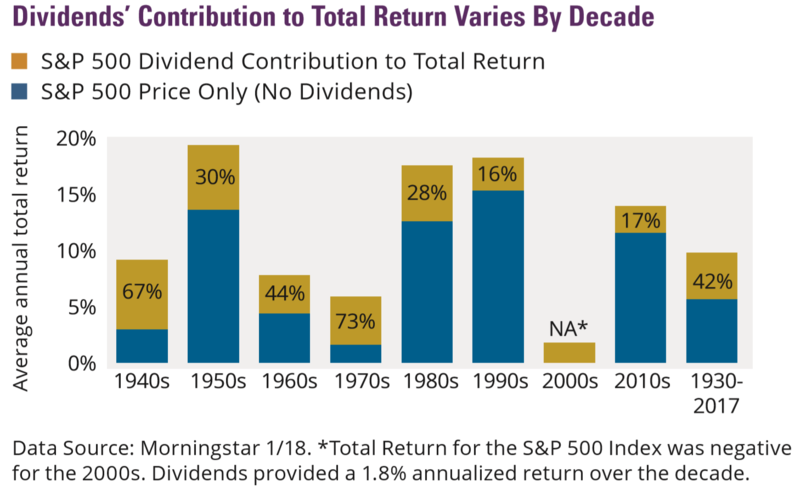 There’s no doubt that reinvesting your dividends to compound your returns is powerful, but if you aim to live off your dividends, your portfolio will likely continue to grow throughout retirement due to capital appreciation. If your goal is to leave a large estate, that’s a personal decision. But if you’re looking to become financially independent, you could be there long before you can live off your dividend income. Another problem with a focus on dividends is it may cause your portfolio to become skewed. 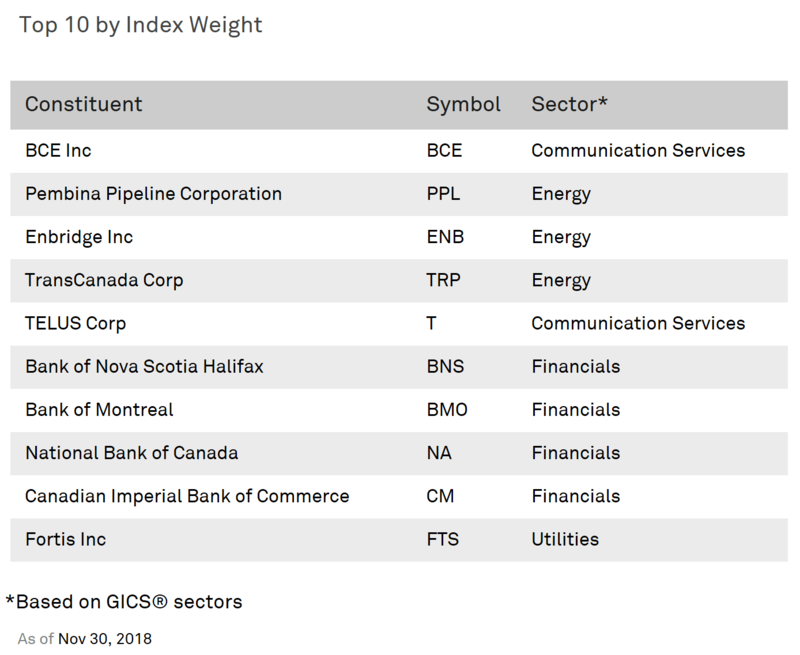 As an example, the top 10 constituents, making up over 50% of the S&P/TSX Composite High Dividend Index currently, are listed below (c/o of S&P Dow Jones Indices). The sectors represented are primarily energy and financial stocks (over 60%), with most of the remaining index comprised of utilities, communication, and real estate stocks. Missing are sectors like information technology (20% of the S&P 500), consumer (17% of the S&P 500), health care (16% of the S&P 500), and industrials (9% of the S&P 500). A dividend stock investor, especially one with a Canadian equity focus, may be ignoring more than two-thirds of an otherwise balanced stock portfolio (using the S&P 500 as a good proxy). Plus, capital gains may be more tax efficient than Canadian dividends in a non-registered portfolio depending on your income and province of residence, so there may be tax reasons to reconsider a high dividend strategy. Ideally, an investor should aim to buy low and sell high, but quite often, retail investors as well as professionals do just the opposite. If stocks fall, disciplined portfolio management may suggest you should buy to increase your stock exposure back to your target weighting. But who wants to buy when stocks are falling? Who wants more of a “bad” thing? Quite to the contrary, stock market declines often breed more selling. Ideally, a long-term investor should look at falling stocks as a buying opportunity. Stocks are on sale. And if a portfolio’s stock exposure has decreased as stocks have fallen, buying would bring your stock weighting back up to target. It can be easier said than done. Likewise, as stocks rise. A disciplined investor should be selling stocks to get back to a target weighting and taking profits. It’s important to treat your different accounts differently as well. A homogenous asset allocation across all accounts may not be appropriate. If you have a non-registered investment account, a Tax Free Savings Account (TFSA), and a Registered Retirement Savings Plan (RRSP), your asset allocation should probably be different. Possibly very different. If your TFSA is an account you may be able to deposit to forever, or for a long time, it should probably be your most aggressive account. If you’re drawing down your RRSP/RRIF and non-registered accounts, these accounts should probably be invested more conservatively. Which account is more conservative may depend on how much you’re withdrawing from each, but you should have a bias towards fixed income in your registered accounts if possible. This is because stocks are more tax efficient (capital gains and Canadian dividends) in a non-registered account compared to a registered account. And ideally, you want to have more growth in your non-registered and TFSA accounts than your registered accounts, given RRSP/RRIF withdrawals are fully taxable. Non-registered withdrawals are partially taxable (capital gains) and TFSAs are, of course, tax-free. Retirees often start their Canada Pension Plan (CPP) and Old Age Security (OAS) pensions as early as possible. For CPP, that’s age 60, and for OAS, that’s age 65. Sometimes, the reason is that people are worried that they’ve retired, and their incomes have dropped, so they don’t want to draw down too much on their investments. It’s a bit counterintuitive, and here’s why. If someone has a long retirement, and lives well into their 80s, the math tends to show they are better off deferring their CPP and OAS as late as age 70. That’s the latest you can defer these pensions. Deferring them results in higher payments – an 8.4% annual increase for CPP after 65 and 7.2% for OAS. Related article: Should you take CPP Early? So, if someone is worried about their investments lasting into their 80s and 90s, they may be better off deferring their pensions, even though that means drawing down their investments more initially in their 60s. You can then draw down less on your portfolio in your 70s, 80s, and 90s, and deferred CPP and OAS may make managing your investments easier as you age. That is, you will have more guaranteed, inflation-protected income, and less required investment withdrawals at a time where you may be a less competent investor or less willing to take investment risk. The knee-jerk reaction of many retirees is to preserve investments early by starting government pensions, and that short-term thinking may increase the likelihood of drawing down investments more heavily in your 80s and 90s. Deferring RRIF withdrawals to age 72 isn’t always the best option. Mind you, nor is starting withdrawals right away. But those who retire early and have modest income in their 50s or 60s are probably best suited to consider some early RRSP/RRIF withdrawals. It’s also important not to paint yourself into a corner by accumulating large non-registered capital gains on individual securities. It’s not uncommon for retirees to have stock positions they’ve held for years with increasingly large deferred capital gains. Hesitating to sell shares or realize gains could make the problem worse if you’re choosing to draw down on other investments, and cause the deferred gain holding to make up an increasing proportion of a portfolio. This can lead to overexposure to a single security or cause you to hold a position not because it’s a fit for your portfolio, but because you’re reluctant to pay tax. In some cases, there can be a benefit to strategic realization of capital gains over time. In other words, intentionally realizing small capital gains while staying in a low tax bracket. Ideally, if you’re rebalancing your portfolio and selling high and buying low, you will trim your winners as you rebalance anyway. Investing mistakes are in the eye of the beholder. Some people may have differing views than mine on retiree investing, and because there are so many different investing styles and strategies, there is never a one-size-fits-all approach. Investing success or mistakes also depend on the point in time you assess your choices. What seems like a wise decision today may be good or bad a year from now and could reverse itself again thereafter. This helps reinforce the importance of planning ahead and being deliberate in your investment decisions, particularly when you’re in the process of decumulation. Saving each month, dollar cost averaging, and accumulating investments is the easy part. Retirement investing is that much more difficult, but hopefully my take on retiree investment mistakes can help. Jason is one Canada’s approximately 150 advice-only, fee-only Certified Financial Planners (CFPs). He does not sell any products or receive any referral fees. He has a particular interest in working with clients with complex financial planning issues, including Canadian expats in other countries, but works with single people, seniors and families at all planning stages seeking to take control of their financial lives. Jason is a Certified Financial Planner at Objective Financial Partners in Toronto and works via Skype with clients across Canada and internationally. He is also a personal finance columnist for the Financial Post and MoneySense. “ Stop losses” are a better way to preserve capital. Get back in once the smoke clears ! Take a look at a graph of long term vs using EMA’s and stops to get out on the way down and back in on the way up. Take out the peaks and valleys and growth is much greater. “ Time in the market” is just what advisors love ! I tend to agree. Market timing is tough. You have to be right twice – selling at the right time and buying back in at the right time. It’s hard enough to be right once! The best time to take your CPP is going to depend on a number of factors, but longevity and risk tolerance are important ones. If someone expects to live well into their 80s or has their other investments invested conservatively, deferring CPP as late as 70 may be a good option to consider. Especially if you don’t have other defined benefit (DB) pensions from a former employer. To reduce accrued gains, we donate stocks to our favorite charity then the cash that would have been used for the donation is used to repurchase shares in the same company. The result is the same share holding but the accrued gain is reduced tax free. Donating securities with accrued gains is a great strategy for someone who is planning to donate to charity anyway. You get your donation receipt and you avoid paying capital gains tax. It takes a bit of paperwork, so the donation needs to be large enough to justify the administrative work involved. Many charities accept a donation of securities. As is the case usually, i tend to agree with the advice provided here. As clearly stated, when to take CPP really depends on your personal situation. Whatever works for you, as long as you can justify it … that is the right decision. My question is this. My spouse turns 65 this June. I am 65 now. Neither of us has taken CPP and I would like to share the CPP. If my wife takes her CPP now, can I continue to defer my CPP until I am 68 and then share, or is sharing allowed only if neither party has started CPP. Hi John – CPP sharing is only possible once you are both receiving your CPP, so “Yes” if your wife takes her CPP now you can share when you apply later at age 68. Thanks Doug, I appreciate your taking the time to answer my question. I am very intereted in this strategy Bernard can you expand on it a little …how does it work? Do you inform the charity and the stock company through a letter? Do you have to apply to reopen a DRIP….would this donation give you a charitable deduction for tax purposes equal to the value of the stock on the day of the donation? Contact the charity you’re considering, Robert, and ask them if you can make a donation of securities (stocks, ETFs, mutual funds). Many charities do these days, especially larger charities. You need to request a transfer from the institution where the securities are held and transfer them “in kind” (ie. as is) to the charity. The charity will issue a donation receipt, just as if you donated cash, but the accrued capital gain will not be subject to taxation. If you had a choice of donating cash or donating securities with accrued capital gains, the securities would be the better choice. I live in Europe and I have a brother that lives in Canada. He is 60 years old.I learnt that he hardly has any contributions in his RRSP which I believe is his pension plan. He tells me that he is allowed to put in about CAD 90K. Also he has a mortgage that he struggles to pay. I want to help and I can easily bring him up to date but I will not send him money directly.I want to deposit my contribution directly in his RRSP and pay off his mortgage. Am I allowed to do that? Would taxes have to be paid in Canada? If you “gift” or “transfer” money to your brother in Canada, Joseph, that gift/transfer is not subject to taxation here. If you want to deposit $90k directly to his RRSP, and he has sufficient RRSP room, he will be able to deduct the contribution on his tax return (in the current or future years if advantageous) and will save tax. I should point out that your brother could turn around and withdraw the contribution the very next day, so it’s not “locked in”. Taxes would be payable by your brother upon withdrawal, but given Canada’s marginal rate tax system, retirees generally pay lower tax rates on withdrawal than the tax savings they received on the initial contribution (therefore, there’s a net benefit). Another option for your brother to invest is the Canadian equivalent of the UK’s ISA – called a Tax Free Savings Account (TFSA). If he has never contributed, he likely has $63,500 of TFSA room. Depending on his situation, it may be better to contribute to his RRSP or to his TFSA. Either way, your mortgage repayment offer and gift to top up your brother’s retirement savings is very generous. I am 56 and have no income but rrsps which I have been drawing down. My husband is 66 and is already collecting govt pensions and a defined benefit pension. I am wondering what your thoughts are on me continuing to draw down my rrsp so it is gone by my late 60s and deferring cpp. Also I was wondering like someone above how I might be penalized for delaying cpp when I have 10 yrs out of the workforce before age 65. We are not struggling so mostly concerned about the tax benefits of rrsp drawdown and benefit of delaying cpp.